HOW DOES LIPOMELT WORK? The unique light emitted from LipoMelt causes the fat cell membranes to temporarily alter the permeability of the cell wall. This brief change allows some of the fat contents to seep out to where it can then be processed by the body. LipoMelt’s LED system has a much higher absorption rate compared to laser treatment therapy due to the refraction and strength of the beam. Typically, each fat cell absorbs approximately 70% of the LED light energy compared to only 40% absorption rate for lasers. The outcome is far superior in inch loss and fat reduction. WHAT HAPPENS TO THE FAT? After being released, the fat is broken down into free fatty acids and glycerol and enters the blood stream. Once in the blood stream, the fatty acids can be either used as fuel or quickly eliminated by the body. Clients undergoing LipoMelt have noticed an improvement with cellulite as well as skin tone and texture. WHAT CAN I EXPECT DURING A LIPOMELT SESSION? During the treatment, you will be placed lying down on a treatment table. Special LED pads will be positioned in strategic places on your body as you simply enjoy a relaxing 20-minute session. WHAT AREAS OF THE BODY CAN BE TREATED? 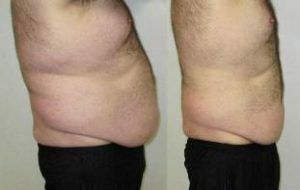 The LipoMelt treatment can be effectively used on essentially every part of the body where localized fat deposits exist. This includes the face, waist, hips, upper legs, thighs and upper arms. WHAT RISKS OR SIDE EFFECTS ARE INVOLVED? There are no risks or side effects involved in using LipoMelt. It is considered a safe alternative to invasive procedures such as traditional liposuction. The LipoMelt treatment is 100% non-invasive and does not cause any bruising or scarring. DO I HAVE TO FOLLOW A DIET? No changes are required, but you can expect better results if you reduce your caloric intake somewhat and increase your water consumption to 8-10 glasses a day. Meanwhile, reducing alcohol consumption will help the liver. Ask us about doing LipoMelt with our Ideal Protein weight loss method for optimal results! DO I HAVE TO EXERCISE? Each of your sessions should be followed by at least 10 minutes of exercise to stimulate lymphatic drainage and help burn the fat that has been released. Our treatment sessions include 10 minutes on the whole body vibration plate to ensure the best results. WHAT RESEARCH HAS BEEN DONE? LipoMelt is based on the pioneering cold light research of NASA and leading clinicians. Call TODAY and schedule your FREE 15 minute consultation! Visit our Workshops page and find out about our next LipoMelt Information Session.